Economists have always known that a government has three sources of money: it can tax it, borrow it, or print it. On top of this, politicians have been announcing grand schemes for further spending: $47 billion on free college tuition; $1 trillion for new infrastructure; $1.4 trillion to write off student loan debt; at least $7 trillion on a “Green New Deal”; $32 trillion on “Medicare for All.” By one estimate, these new proposals total an estimated $42.5 trillion over the next decade. Adding these new spending proposals to the flood of red ink the CBO projects just from following the current path, the federal government is set to face a serious fiscal crisis in the not too distant future. Or, perhaps not. According to “Modern Monetary Theory” (MMT), a newly prominent idea supported by the likes of Rep. Ocasio-Cortez, we don’t have to worry. MMT starts with the observation that a government that prints the currency it borrows in cannot become insolvent. It can always print as much money as it needs to cover any liabilities. Of course, if a government starts printing money to pay its bills, there is no guarantee the money will be worth anything. This is true but hardly groundbreaking. Economists have always known that a government has three sources of money: it can tax it, borrow it, or print it. Of course, if a government starts printing money to pay its bills, there is no guarantee the money will be worth anything. So far, all MMT amounts to is that you don’t need to worry about turning into Greece if you can turn yourself into Zimbabwe, instead. This is why most economists have been wary of monetary financing of fiscal policy except in wartime. Indeed, when the University of Chicago’s Booth School of Business surveyed a group of economists recently on the questions “Countries that borrow in their own currency should not worry about government deficits because they can always create money to finance their debt” and “Countries that borrow in their own currency can finance as much real government spending as they want by creating money,” not a single one of them agreed with either statement. This says that the money supply in an economy (M) multiplied by the number of times it is spent in a given period (velocity of circulation, V) equals the price level (P) multiplied by output (y). Again, this is a truism. It simply says that nominal spending (or aggregate demand, MV) equals nominal income (Py). As all spending is someone else’s income, this is true by definition. But the equation becomes more interesting when we make assumptions about its component variables. If we assume that y is fixed by real factors and V is constant (the old monetarist assumptions), it follows that any increase/decrease in M must be offset by an increase/decrease in P. “Inflation is always and everywhere a monetary phenomenon,” as Milton Friedman argued. In this case, the increase in the money supply (M) MMTers propose will simply raise prices (P); inflation, in other words. This is the core of MMT as policy: higher government spending funded by printing money and the use of higher taxes. We can escape this trap, MMTers argue, by tinkering with the other variables. Velocity of circulation is, perhaps, the trickiest one conceptually. One way to think of it is as the inverse of the demand to hold money. If your desire to hold money increases—you might be saving for a rainy day—you will not spend it, and your velocity of circulation will decrease. This will offset, to some extent, any increase in the money supply. MMTers propose to use this to control inflation. As inflation accelerates, people’s demand to hold money decreases; they try to spend it before its purchasing power erodes. This drives up V and accelerate inflation even further. But the government can impose a higher tax burden which must be paid in the depreciating currency and people will need currency to cover this. By increasing taxes, the government can increase money demand, or, at least, slow the velocity of circulation. This is the core of MMT as policy: higher government spending funded by printing money and the use of higher taxes to deal with any resulting inflation. For MMTers, Friedman is dead wrong. Inflation is never and nowhere a monetary phenomenon. 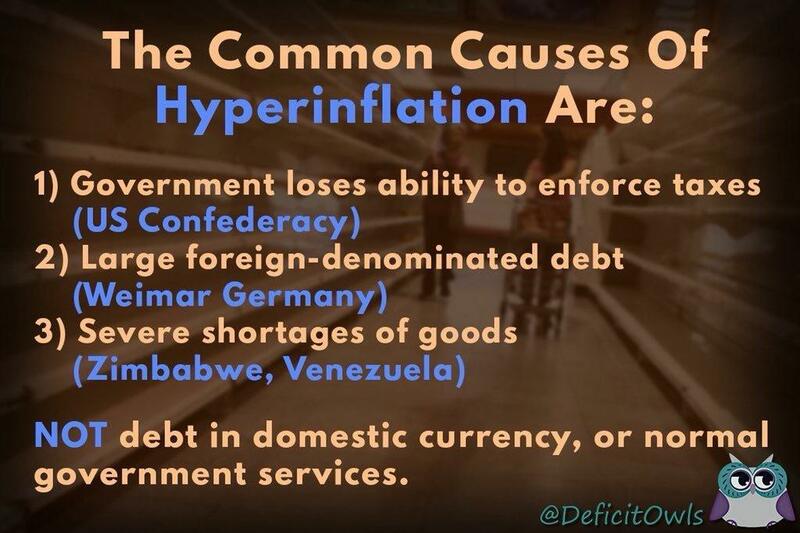 As the picture below argues, inflation is the result of either a failure to manipulate V (the US Confederacy) or a collapse in y (Zimbabwe and Venezuela). Needless to say, historically these explanations are scarcely credible. There is no reason to believe that MMTers would be able to control inflation by the methods they suggest. Imagine a government operating on MMT lines. It prints money and spends it. Prices start to rise. The government raises taxes. This takes time—the passage of a tax bill as opposed to the relatively quick expedient of selling securities, which central banks do when they want to accomplish the same aim. Even if passed, this tax hike reduces output (y), exacerbating the problem. Furthermore, to take money “out of the economy,” the government would have to run the sort of budget surplus MMT is predicated on freeing it from. The money raised by these high taxes—assuming they brought it in—could not be spent or redistributed. It has to be destroyed if the money supply (M) is to be reduced. As British inflation hit 26 percent in the 1970s, the government tried all manner of taxes to "sop up" "excess purchasing power," all without any notable success. The current GDP of the US is about $20 trillion. Perhaps dumping in a couple of million here or there might have little impact on overall inflation. But that is not what is being proposed. MMT advocates, such as Stephanie Kelton, argue that MMT offers a way to fund multi-trillion dollar programs such as a jobs guarantee and universal health care. The $32 trillion estimated cost of “Medicare for All” is the equivalent of 160 percent of current GDP. Modern Monetary Theory isn’t monetary policy so much as a way of escaping the inevitabilities of fiscal policy. It is beyond belief that the Federal Reserve could pump that much money into the economy without serious inflation. There is an old joke: What does a parrot have in common with the Holy Roman Empire? The parrot isn’t holy, Roman, or an empire. MMT is the same. It isn’t very modern; cranks throughout history have been saying that we would be rich if only we had more of the medium of exchange. It isn’t monetary policy so much as a way of escaping the inevitabilities of fiscal policy. And its theoretical basis is a banal truism. It is simply the latest in a long line of claims to have found a Magic Money Tree for government.